The company moves into smartwatch territory. With CES, the Consumer Electronics Shows in Vegas, taking place in early January, it didn't take long for us to get an early taste of tech in 2016. One of the biggest announcements on the wearable front was a new product from the leading activity-tracker brand: the Fitbit Blaze from Fitbit. Currently available for pre-order for $199.95 via the Fitbit website, this device includes the usual activity-monitoring features you'd expect, but it also adds in some smartwatch-style features. These include alerts sent to your wrist for calls, texts and calendar alerts, plus the ability to control music playback from your smartphone from the Fitbit Blaze Itself. As far as the more fitness-focused features go, this device tracks your heart rate, along with your activity across several different sports thanks to the Multi-Sport feature. So if you're running one day and biking the next, the Fitbit Blaze should be able to detect the difference and account for each workout session accordingly. There's also SmartTrack, which logs all your activity info without requiring you to push a button or in any way manually log your workouts. And, as usual, thanks to the Fitbit app you'll be able to view a summary-type view of your activity, which can be useful in detecting patterns over time. Most of the new features seem to be related to the Fitbit Blaze's smartwatch-style functionality. While the device can deliver notifications for texts, email and more as mentioned earlier, it also includes some more aesthetically-minded design tweaks. For instance, the "watch face" itself sports an octagonal shape, which seems like a compromise between the popular round displays found on smartwatches like the Moto 360 and the more standard rectangular screen on many other smartwatches, including the Apple Watch. The watch face also has a color touchscreen (a first for a Fitbit product) that can display a variety of different digital watch faces. Also on the design side, Fitbit will offer the Blaze with a number of band choices. The default, which comes with the $199.95 model (available in black, blue and plum, by the way) is a rubberized "Classic" band. You can buy one in an additional color for an extra $29.95. The other options are Metal Links + Frame, which costs $129.95, and the Leather Band + Frame, which costs $99.95 and is available in black, camel and gray. 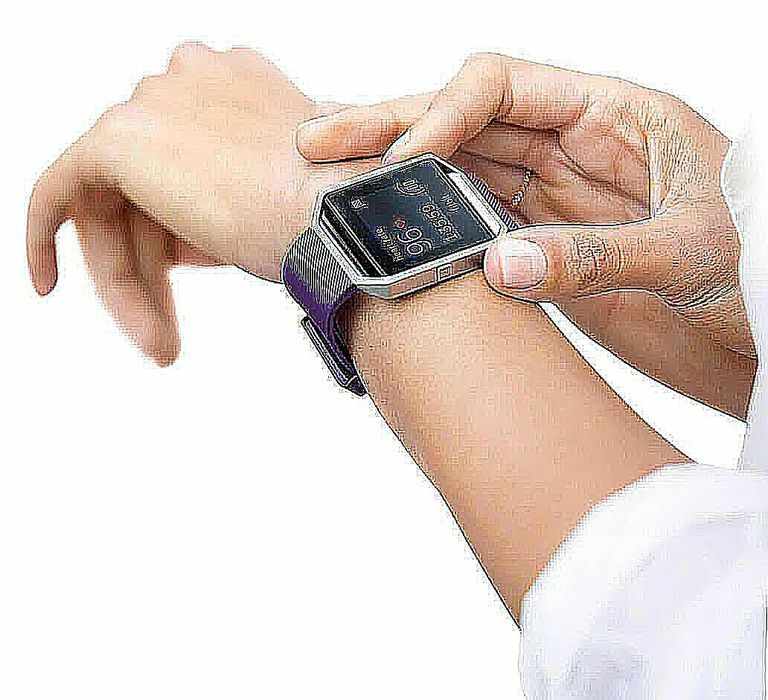 Is It A Real Smartwatch? Given the non-fitness-related features, it's clear that Fitbit wants to market the Blaze to consumers who might be interested in a smartwatch in addition to a fitness band. But does it really compare to Wear OS (formerly Android Wear) devices, the Apple Watch and others? It's too early to say whether the Fitbit Blaze makes a good smartwatch or not, but it is worth noting that this device runs a proprietary operating system that is not Wear OS. That means it won't offer the same level of integration with your smartphone, and you won't have a ton of options when it comes to apps. Basically, this is a pared-down smartwatch with some great fitness-tracking capabilities. It does make some compromises when it comes to the fitness features too, though. For instance, it offers "connected GPS" — meaning you'll have to have your phone with you and have the device paired to it via Bluetooth — in order to map your running, biking and waking routes. By contrast, the Fitbit Surge, a more dedicated fitness device, includes built-in GPS. I'm looking forward to learning more about the Fitbit Blaze and giving it a test run. So far, it seems like a device that may make too many compromises (both feature- and design-wise) to please everyone, but Fitbit isn't the best-selling activity tracker company for nothing!